It’s been 20 years since the last DEVO album was released…dang that seems like forever ago! If memory serves correctly, MizMuze wasn’t even able to drink her Greek Muze Ouzo back in 1990 (legally, that is)!!! But I do remember vividly when DEVO’s fantastic 1980 Freedom of Choice album came out…MizMuze was gettin’ her groove on to “Whip It” and dancing around in her kiddie toga…ahhh, good times. DEVO’s ninth studio album, Something For Everybody dropped yesterday. 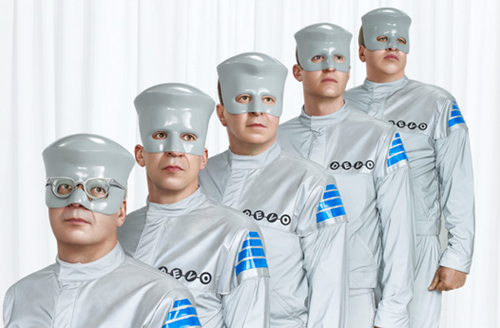 DEVO conducted a “Song Study” via an online survey to determine which of their 12 of 16 songs were to be included on the new album. What that means is that you have the Freedom of Choice when deciding which of the three album versions to buy: The Standard Version which is “88% focus group approved.” The Song Study Version which is 100% focus group approved. Or the Deluxe Version which includes all 16 songs plus four bonus tracks.